When it comes to writing, The Practice of Creative Writing has a simple message: you can do this, and it’s worthwhile to try. Designed for all students in the introductory course, The Practice of Creative Writing teaches students how to harness their imaginations to focus and create stories. Heather Sellers, who writes in multiple genres herself, has developed an approach that focuses on the elements and strategies that produce good writing in any genre: Images; Energy; Tension; Pattern; Insight; and Revision. She provides opportunities to be playful and to experiment at the same time that she teaches students the importance of discipline and craft. 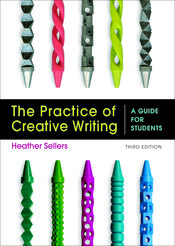 In addition to writing strategies and process, The Practice of Creative Writing teaches students how to read like writers, featuring ample and diverse readings in every genre. As a result, students come away with more sophisticated reading skills and exposure to a wide range of innovative and new literature. This new edition features a wealth of new readings, as well as coverage of revisions, short forms, and new genres, such as lists and monologues.